I don’t know about you, but I don’t go to the market often enough to buy fresh ingredients and flowers. Just the thought of a crowd can be enough to dissuade me. Two Saturdays ago, we decided to break out of hibernation mode and make a day of it. Inspired by the recipes we found on-line from Mario Batali’s NYC Roman eatery LUPA, we decided to cook our favorite pasta dish at home. We headed to the best Italian market in the city: Milano. 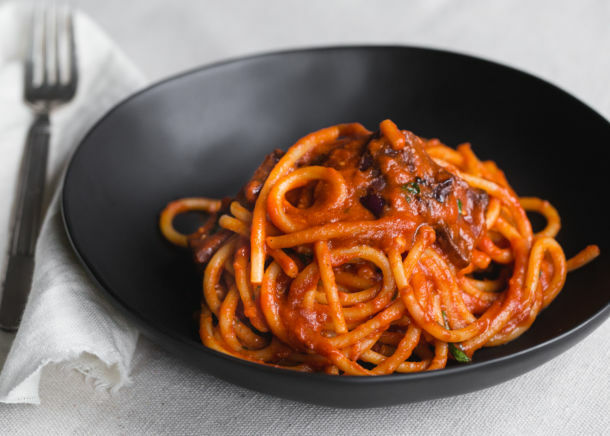 Fresh pasta and rows of tomato sauces – O My! Even though it took over an hour to gather a few things, by giving ourselves the afternoon to purchase what we needed, it became an adventure. The sun was out and on the street several people were rushing to local coffee boutiques to have their coffee machines fixed. They cradled their machines in blankets as though they were bringing a child to the doctor’s office. I love Montrealers’ dedication to coffee. We then went to the very busy Atwater market to buy fresh flowers. The colors were energizing! I am happy to say that my pink carnations still look great two weeks later. I love that it feels like Spring inside, even though it’s below zero outside. It’s amazing how giving yourself the time to poke around in your own city can transform a weekend. All too often buying groceries is a rushed chore, instead of a tasty experience full of trying new treats, taking a moment to smell fresh basil, or experiment with an ingredient for the first time. 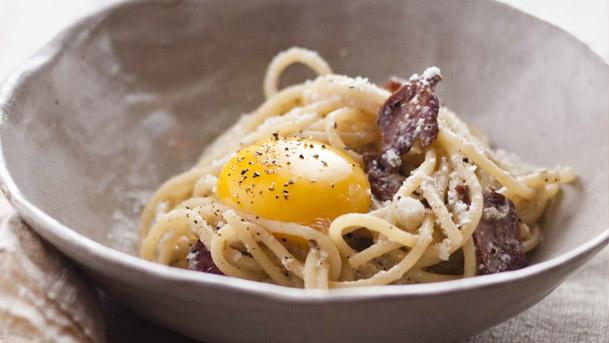 Try Mario Batali’s Bucatini all’Amatriciana, or my personal favorite, his Spaghetti alla Carbonara. He provides recipes, photos, tips, and videos that make cooking easy. All photos via his site.